Exclusive design villa with 2 levels, 15 min to city with car. Heated Pool and Sauna (May - September) Golf Course-3min Walk, just one golf drive from the house! 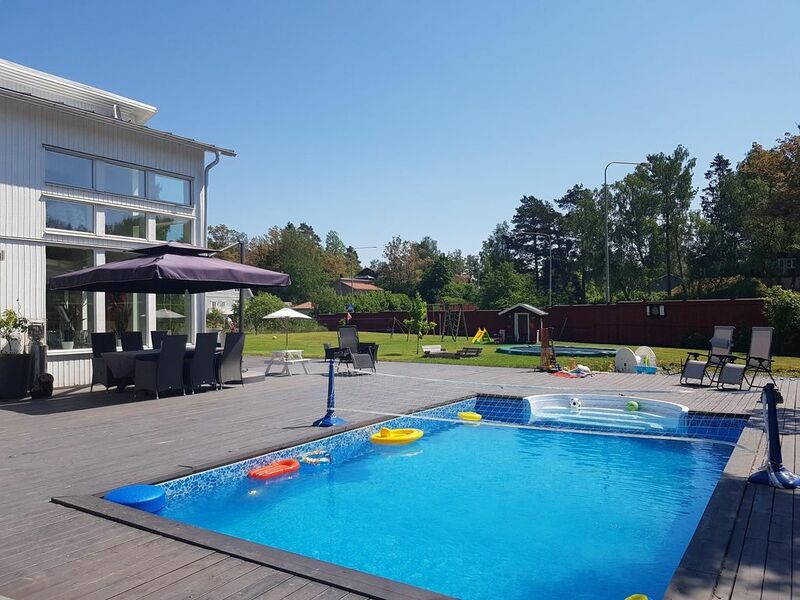 (Ågesta GK) Tennis court 200m from the house available for free! Big terrace with pool and a big garden with a large area to have activities on. Lots of fun to do for the kids with a built-in trampoline, playhouse, swings and more! Beach, shopping center and nature reserves nearby. The house is the perfect foundation for a fantastic vacation in Stockholm. Anne & Jimmy's house is absolutely lovely, warm and comfortable. They were friendly and attentive, checking in with us several times during our extended stay and answering any questions we had immediately... The kitchen, the bedrooms, and the lovely sauna provided an easy and comfortable visit, and the location was very convenient for all of our adventures. Bonus: the house was beautifully decorated for Christmas, with all kinds of little touches that really made the holidays for our kids. Absolutely the only reason this isn't a five star review is that while we were visiting there was a silverfish infestation on the lower level, which was unable to be resolved during our stay (although we know there are plans to take care of them soon!) Thank you, Anne and Jimmy, for allowing us the use of your beautiful home! Perfect house with everything you need in a great location for the city. We have visited Stockholm several times with our two children and have usually stayed in the city centre in an apartment or hotel. Having now tried this luxury house we wouldn't stay anywhere elsem the house itself is fantastic great outside space and a nice heated pool. Inside the house was very clean and had all the amenities you need as well as great connectivity for the sound system and TV. Could not recommend this place more will definitely be staying again. A paradise for little princesses and for anyone else! We spent 6 wonderful days at this beautiful house and we were all a little bit sad, when our stay was over. There was sufficient space for two families (4 adults + 4 children 4 / 7 / 8 / 8) so that we felt very comfortable (for elder children it would be a little bit narrow). The house is furnitured and decorated very lovely and very modern and equiped with lots of technical stuff. It is acutally as beuatiful as the photos promise.